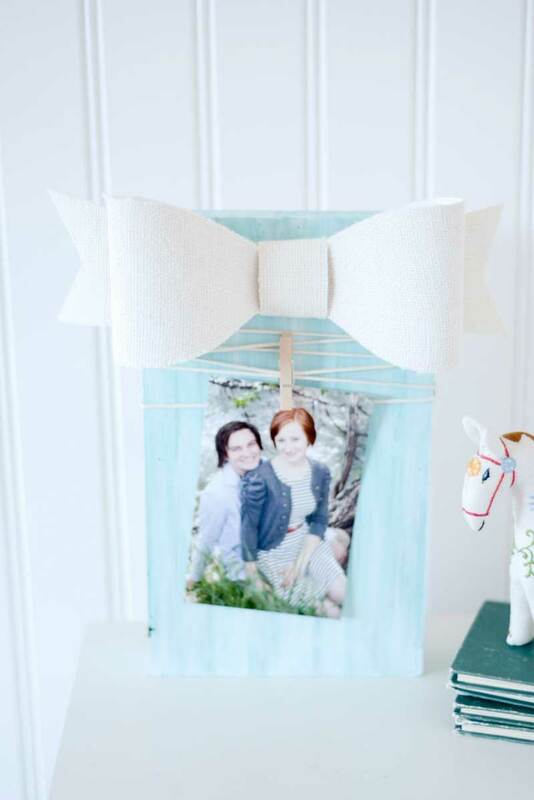 Personalize your next photo display with a burlap bow. It will come together in minutes for lasting effects! Paint wood block desired color. Set aside to dry. While the paint is drying, use the template piecesto cut out 2 bow loop pieces, one ribbon back, and one bow center from desired burlap piece. Bend the bow loops in half and hot glue them together. Adhere the ribbon back to the bow loops and wrap the bow center around, adhering it in place. Wrap string around the board. Attach a clothespin to the string to hold a photo. Adhere the bow to the wood block above the string and then add in desiredphoto. Change the size of the base as needed to accommodate the current project and/or size of photos. Alter the bow by adding paint dots with the paintbrush.